Diana Day always had a sewing machine. And, “I always wanted to have a shop like this one.” Today, she has it altogether at the new Made in Harlo Shop which doubles as Diana Day’s Quilts ‘N’ Things. Diana now has a large quilting studio, the makings of a future fabric shop as well as an outlet for the wares of area artists and craftspeople. Located in the old bakery building next to the post office, she has a great location with ready made traffic and a large and growing stock of gift items. Business has already been brisk since opening on December 2. Diana sewed her first quilt at age 12 and added more sewing and embroidery machines to enhance her work over the years. She sewed for her children when they were growing up. Her girls got new outfits each Christmas thanks to Mom’s sewing skills. Now, she’s doing the same for grandchildren. Pajamas have been requested by granddaughter Tristan for her Mom. Mrs. Day was born in Minnesota and grew up in North Dakota in a small town near Fargo. She moved to Montana after high school because “It was a good place to go.” Diana raised her family of four in Helena while employed by the State of Montana. She worked for the length of her career with the state in licensing of one sort or another, starting in Professional and Occupational Licensing. In here last position with the Department of Natural Resources, Diana licensed water well drillers. For many years (17 altogether now), Day worked evenings and weekends as a Mary Kay Cosmetics Consultant. And, that’s how she met Mr. Day. Two her clients were recruiters for the Montana National Guard. They suggested that Diana and Bob get together. And, they did. Diana moved to Harlowton, thirteen years ago. Bob was teaching high school. Diana’s major work interest at the time was Mary Kay. “I could do Mary Kay anywhere.” So now, she does it in Harlowton with regular trips (four times a year) to Helena to offer open houses for her long-time clients. The Women’s Club played an important role in Diana becoming a professional seamstress. Mrs. Day had been sewing for many years and became more interested in the art with the purchase and use of a serger and a handy quilter. 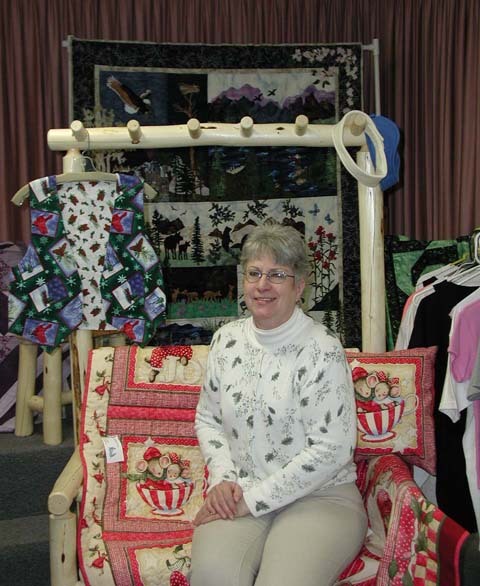 She enrolled in classes each September for seven years at the Rocky Mountain Sewing Festival in Billings. But, it took a Women’s Club craft show to get her present business going. Five years ago, Diana took samples of her work to the show and thereafter began to take special orders for her wallhangings and “stained glass” angels. A year later, she opened Diana’s Quilts-N-Things at her home. Just two years ago, Gwen Tomlinson, Teri Sell and Freida Robertson opened The Made in Harlo Shop. This year, Diana and Frieda picked up the operation and the responsibility for the shop. But with Frieda becoming increasingly busy with orders at Cream of the West, Diana became the chief worker, organizer, and administrator at the store. The need to relocate The Made In Harlo Shop brought the business to the old bakery. The Days have lived in the old Sorensen house for 11 years. And now, they are doing business at the old Sorensen Bakery. The change has been a relief and release at the Day residence. “You wouldn’t believe my Mary Kay room looks like a Mary Kay room, now.” Bob probably feels equally amazed at other changes. The Made in Harlo Shop now has products created by over fifteen local vendors. Their works include cloth items, such as quilts, wallhangings, table runners, placemats. Wood articles, pine furniture, metal sculpture, obsidian knives, pottery, candles, griddles and honey also brighten up the new and happily decorated spot. The shop is open from 10 to 5 Monday through Saturday and can accept credit cards. Part of the building is devoted to Diana’s sewing studio and will eventually offer sewing supplies, materials and fabrics. Diana anticipates opening the basement up for her quilting classes. Robin Lammers would like to teach weaving classes, as well. The basement will also be available for community meeting use. Day has sewn uncounted quilted wallhangings, runners and placemats. Some by pattern and some of her own design. One of her most popular pieces is an Advent calendar with a nativity scene.